4 How to Fill Acceptance Form? JDST 2019 Result Declared. Selection through JEE Mains/NEET scores will happen after the final results are declared. Just follow the below steps to check the JDST 2019 Result. Step 1 : To find out your result, visit the official website of Dakshana Foundation through provided above. Step 2 : Enter your Dakshana roll no and Click on “Submit” button. You will receive an Interview confirmation letter by email, to the email address provided in this form and email ID registered with us, by Tuesday, March 26, 2019. The letter will contain details of time slot and place of interview. The first step towards final selection as a Dakshana Scholar is complete if you have been shortlisted for provisional selection. A confirmation mail of the student being shortlisted has been sent to his/her email ID (provided during online registration). Kindly check your email. Enquiries on telephone will not be entertained. 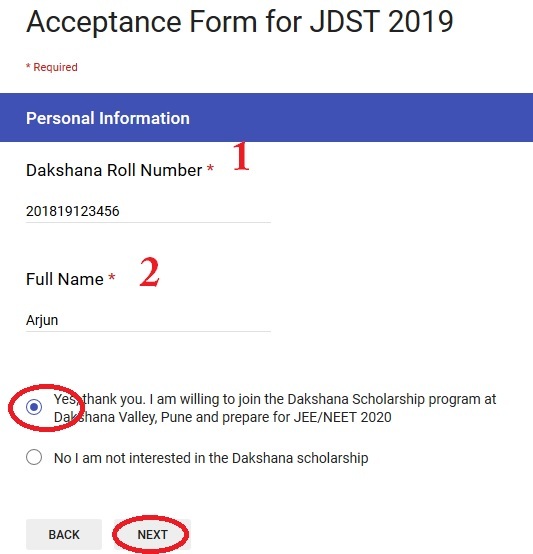 Kindly send any queries by email to jdst [AT] dakshana.org only. How to Fill Acceptance Form? Step 9 : Select Have you appeared/appearing for any of the below exam ? The above documents are essential to attend the personal Interview One Parent MUST accompany you for the interview. Over 8,500 students took the Joint Dakshana Selection Test on December 09, 2018. Due to limited dorm and class room capacity, we are only able to accept the most promising ones. However, we would like to inform the remaining students who appeared for our test that you have all the talent needed to go to IIT or Medical college. The deadline for submitting the acceptance form is Sunday, March 24, 2019. Please note that this is a shortlist and NOT the FINAL selection list. Final selection list will be released latest by 3rd week of May 2019. Where can I get the student’s shortlisted and final list? The result is not available in the website. When will it be available?